I let myself sleep in this morning knowing I had fewer miles to do today to get my location. 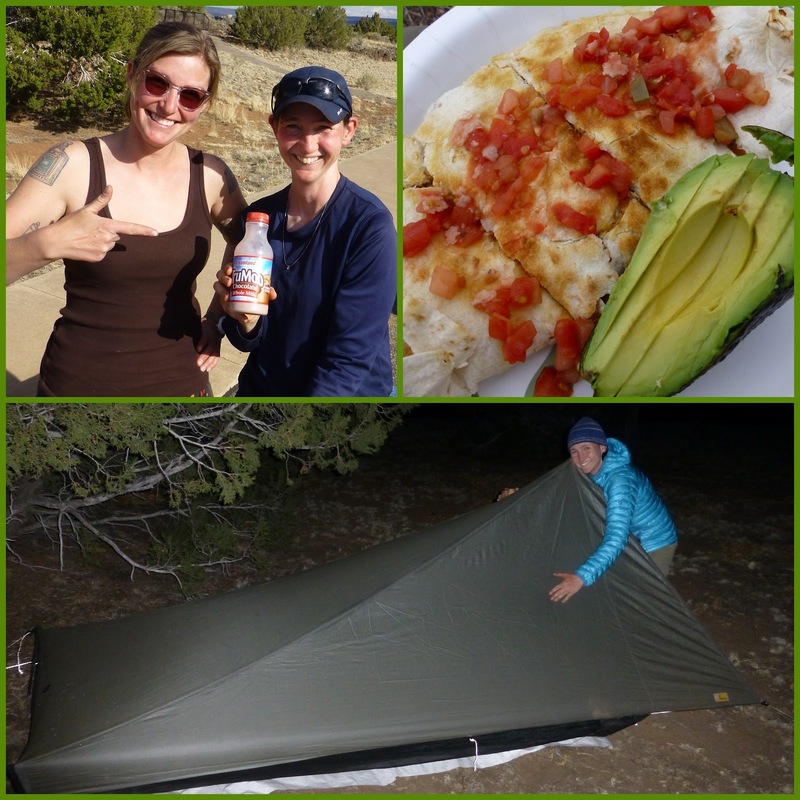 My friend and fellow 2011 PCTer, Wandering Dot was set up doing trail magic 19mi away and I planned to camp with her tonight. It was great motivation because she said she had chocolate milk, lemonade, and quesadillas waiting for me! I tend to not look too far ahead and examine the maps too much (other than the next water stop) because I like to be somewhat surprised. Well, let’s just say that I was quite surprised today. I had no idea today was going to be as time consuming as it was. I started off on the Rim Trail of what is called the Narrows. 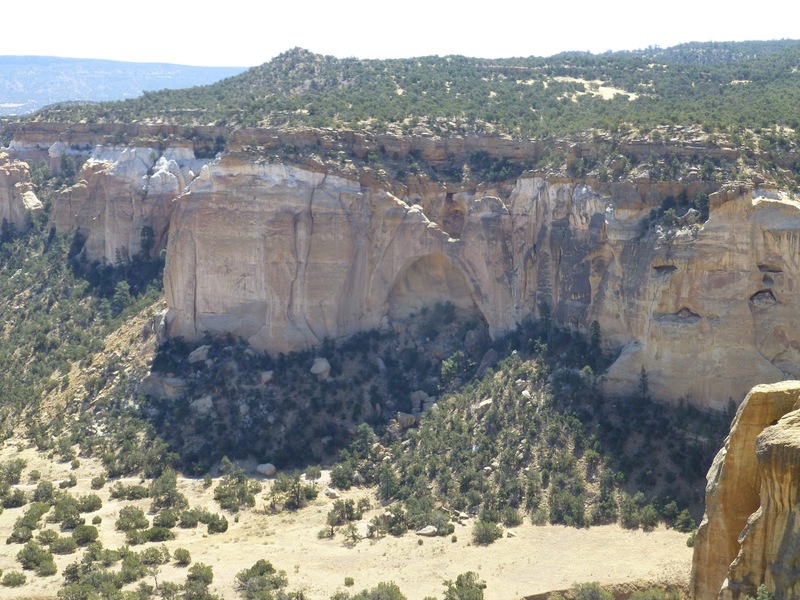 This is listed as a popular alternate that “is not to be missed.” I had the option of just walking down below along the road or going up top on the Rim and then doing a “bushwack” down. 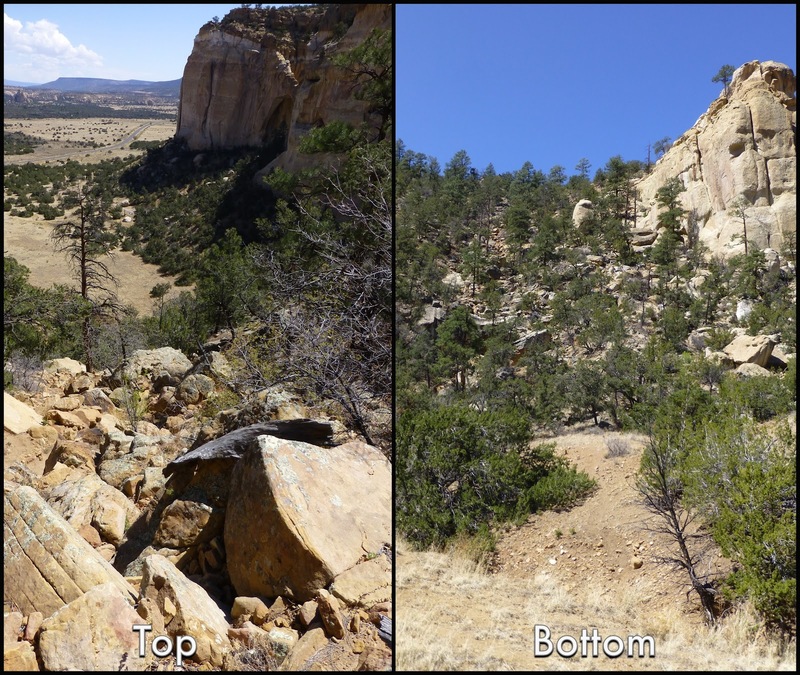 I figured I hiked all the way here, I might as well experience the suggested things and check out the Rim Trail. The walk atop the Narrows was nice. I was up high and could see the expansive lava field I’d be crossing the second half of the day. It was rocky and I wanted to avoid breaking the tips on my poles, so I needed to be careful with my ankles. Many car tourists were down below getting pictures of the popular Arch in the rock. Here is what it looked like. It was more time consuming than I expected to hike the Rim Trail. I also got really good service up there and was able to get some things done and blogs posted. The sun was strong today and it got hot up there fast! The Rim trail dead ends a couple miles in and my CDT map had a note that across from the Arch was an area to “bushwhack” down. Well, let’s just say that my definition of bushwhack does not involve a steep rock scramble down rocks and boulders. It was such a scramble that I thought I must not be in the right place. I completed it anyway cursing most of the way down. When I got to the bottom about 30mins later, there was a clearly worn trail leading from where I came…so yes indeed, I was in the right place. Let’s just say I wouldn’t recommend that route for most people. Here are shots of what it looked like from the top and bottom. It was HOT and I was pretty drained, so I took an early lunch in a shady spot. It was pretty defeating that I could practically see my previous night’s camp spot not far from where I ate. I had done a lot, but made very little forward process to my chocolate milk reward. Luckily, while I ate, the clouds gathered once again to provide shaded relief. I had a highway walk and lava walk ahead and the clouds were a welcomed sight! Here is the view of the Narrows as I walked down the highway. 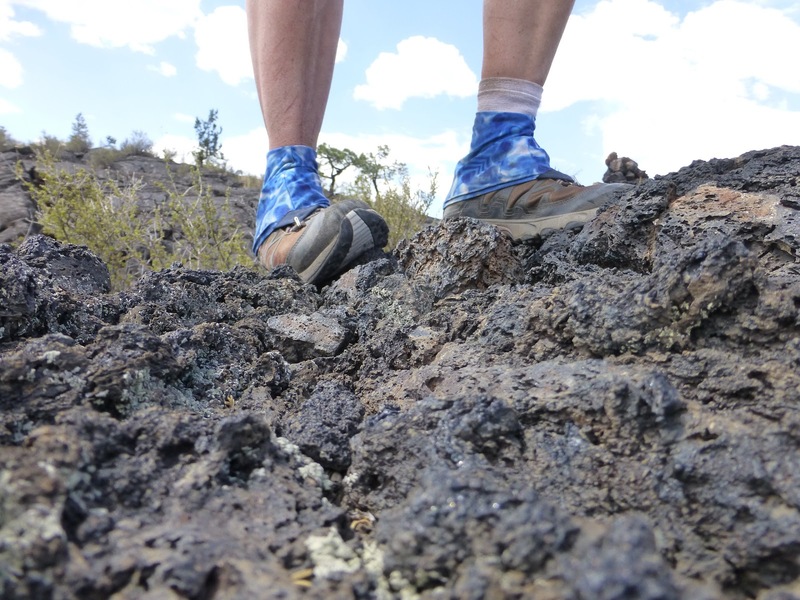 After my experience with the Rim Trail, I wasn’t going to underestimate the lava walk. 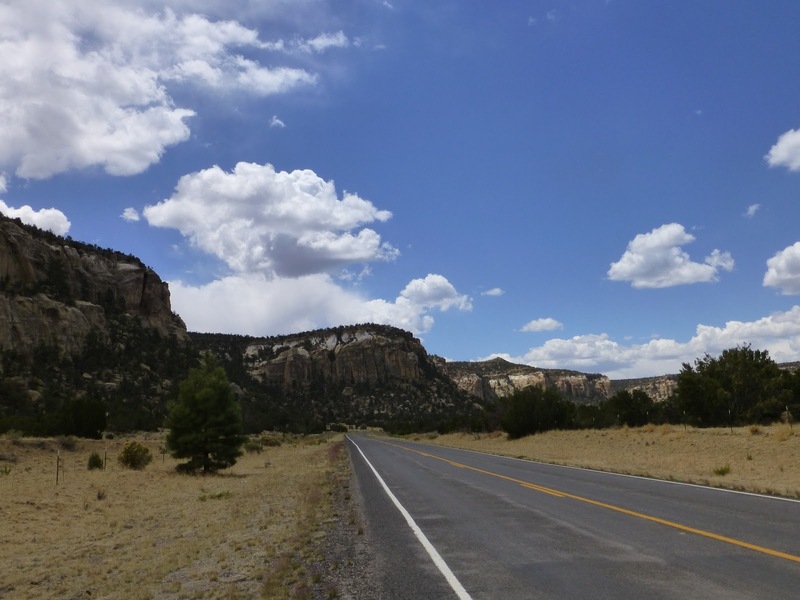 The Acoma-Zumi Trail is the 8mi trail I was to take. The notes on my map say to allow at least 4hrs to get through it. On the other side, was my chocolate milk…I did it in 3.5hrs! The power of chocolate milk! Walking on lava is extremely hard on the feet. 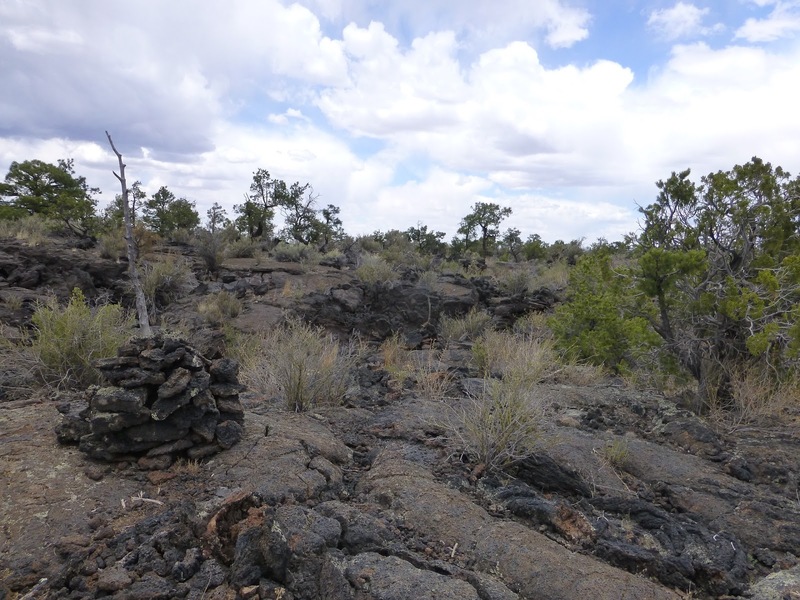 This trail varied from shirt stretches of sand to crumbled lava pieces, to large boulders. 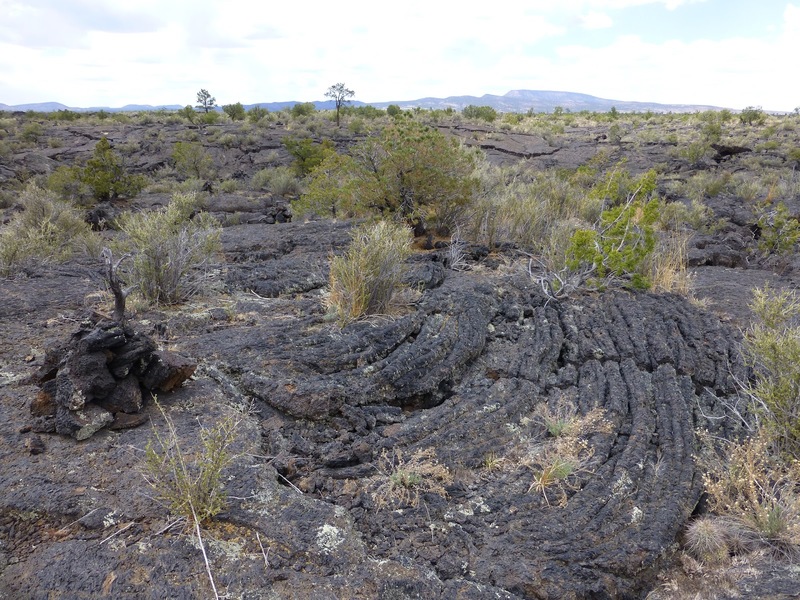 This lava apparently seeped up from the earth long ago. The area is called El Malpais, which means The Badlands. There were cairns to lead the way. I saved my music for this section knowing it would be painful and slow going. Early on, I met a woman who said the cairns got more difficult to spot further in and “don’t move until you see it (the next cairn).” When she made that comment, it immediately made me think of one of my favorite movies, “Searching For Bobby Fischer.” A movie about a young boy who is a chess prodigy. There is an important part in the movie where his chess teacher, the great Ben Kingsley, tells the boy, “Don’t move until you see it, don’t move until you see it.” For about an hour I just thought about that movie and each scene and the great music by James Horner. Just love that movie! I ended up flying through it and kinda enjoyed it. My music was great and it was fun to figure out the maze of cairns. 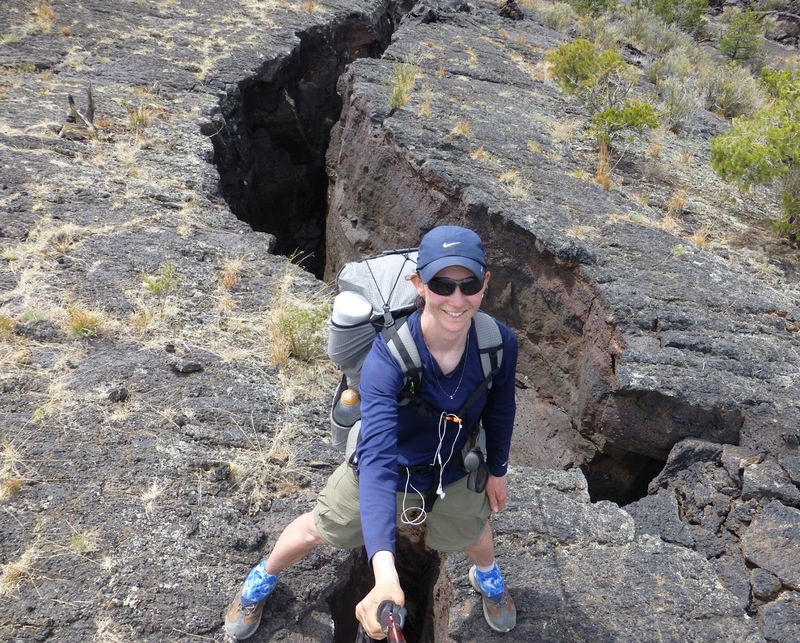 At times, I thought it looked like I was hiking on one big cow pie, ha! There were even large cracks in the lava to step over that creeped me out with how deep they were. I wasn’t able to use my hiking poles on the hard lava, so I was very concerned about going through the ankle landmine without them. The road walking this past week must have helped because there wasn’t a peep from bad ankle and hardly a word from fat ankle. I was shocked! Fat ankle has been on probation and in an elastic brace. If this continues, she may be released early for good behavior! I did have hot spots on the balls of my feet that turned out to be blisters later when I stopped. I usually don’t get blisters there and that is not a fun place to have a blister. I’m happy I am taking a zero when I get to Grants! At the end of the lava, Wandering Dot was there with my chocolate milk reward, which I downed immediately! Dot had this whole trail magic thing perfected. While I walked another 3mi, she set up her Tarptent Contrail for me so I wouldn’t have to set up a tent tonight. She also had a lawn chair waiting with lemonade and and amazing quesadilla. What a great ending to a rough day! Here I am with Dot, my chocolate milk, my quesadilla, and the Tarptent Contrail, which I have at home and have missed dearly! THANK YOU Dot for a relaxing night after a long day!!! Tomorrow is an 18mi road walk into Grants where I will take my first zero…I see a Survivor marathon in my near future!